Design Incorporated has always been proud to support Subsea UK with all their above and below-the-line marketing collateral. This support extends across all aspects, covering branding, websites, advertising, events, exhibitions, directories, brochures and newsletters. As the governing body for the UK’s subsea industry, working alongside government, industry bodies, research & education institutes as well as for the benefit of the 1000 UK companies and 50,000 people involved in the industry, it is crucial that their message and creative profile is always accurate, trustworthy & knowledgeable. Aberdeen-based Subsea UK rely on creative agency Design Inc not just for these values but also to manage their needs in the most cost-effective, hassle-free and innovative ways. 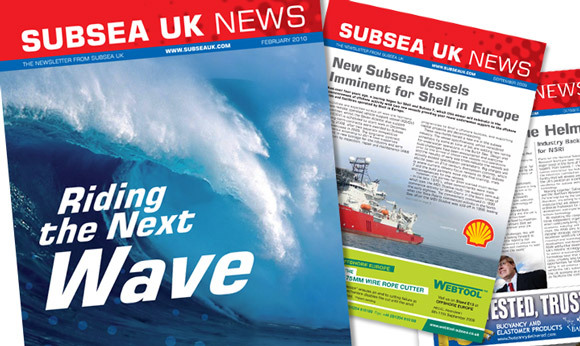 The publishing of the quarterly Subsea UK newsletter is just one of many design & creative projects for which Design Inc is responsible. View more creative work for Subsea UK and the subsea industry. View examples of brochure design, newsletter and corporate literature.